RCL Microwave specializes in broadband material characterization. Many companies do not offer 1GHz – 100GHz broadband dielectric characterization. RCL Microwave does. RCL Microwave offers broadband dielectric characterization broadband material characterization over a broad range of frequencies such as 10 MHz to 10 GHz, 270 MHz to 27 GHz, 400 MHz to 40 GHz, and 1.1 GHz to 110 GHz. We use a harmonic frequency grid for measurements to accommodate Fast Fourier Transforms and Inverse Fast Fourier Transforms. We can test liquids, powders, paints, epoxies, circuit board materials, plastics, magnetic and virtually any other material. RCL Microwave uses a number of fixtures including our own precision coaxial airlines, microstrip fixtures and waveguides connected to a Vector Network Analyzer to characterize a variety of materials in the microwave and millimeter wave range. 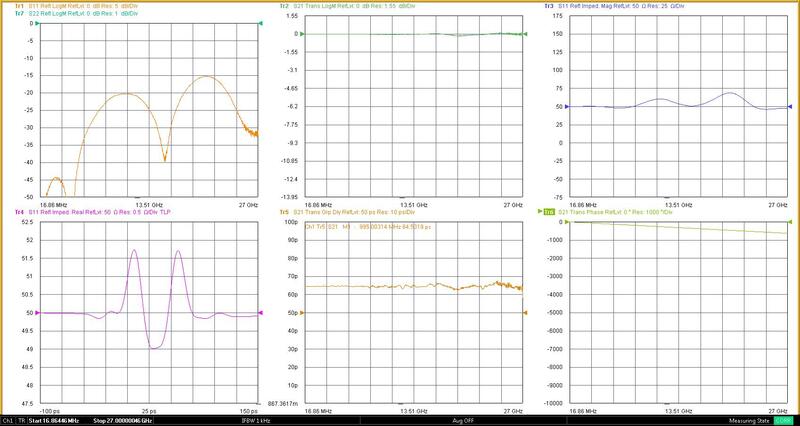 Our 27 GHz Teflon supported airline s parameters can be seen below. Our precision coaxial airlines are available for purchase so please contact us if you are interested in purchasing those. The Microwave dielectric test fixtures developed by RCL Microwave enable fast and accurate measurement of complex permittivity and complex permeability of various dielectric materials using the coaxial test fixtures. The Microwave Thin Film Dielectric test fixtures developed by RCL Microwave enable fast, accurate and non-destructive measurements of complex permittivity of thin-films to 20 microns for a variety of dielectric materials. The accuracy of measurement is achieved by using precision airlines that are then calibrated out of the test setup to achieve zero loss and zero phase. Once a material sample is inserted into the test fixture the effects due strictly to the dielectric under test are inverted using a modified Nicholson Ross Weir technique that eliminates the half wave resonance issue. Further correlation between the Vector Network Analyzer measured data and 3D electromagnetic simulation software are used to validate data. We also offer measurements that evaluate S Parameters, Crosstalk, Delay, Impedance vs Time, Delay of lines by TDR, Propagation Velocity and other parameters that can be evaluated by a Vector Network Analyzer. We can also run CST models for customers who need an extra computer and software license in a pinch. When you need to confirm the dielectric constant of a sample, we perform materials analysis and testing for a wide range of industries and sample types. When you need to confirm the dielectric constant of a sample, we perform materials analysis and testing for a wide range of industries and sample types. We use state-of-the-art instruments and techniques to provide you with confidential consultation, expert analysis and reliable results. Supported by a broad array of instrumentation, we apply a full spectrum of standard and customized analyses to your project. These are the S Parameters for the RCL Microwave 27 GHz airline that is ideal for characterizing powders and materials that need to be contained. It can also be used for characterizing higher loss materials whose Loss Tangent is greater than 0.005. RCL Microwave promises every client thorough, accurate and confidential results. RCL Microwave implements testing methods to address a wide scope of analyses across many different industries and applications. RCL Microwave guarantees thorough, confidential results as a competitive differentiation. First, RCL Microwave will evaluate your specific needs. You will work directly with a project leader to assess the nature of the problem and determine the best approach. Whatever the industry, whatever the problem, we will help you explore the available options to find an analytical approach tailored to your specific needs. We use a wide range of fixtures to characterize materials. These include our RCL Microwave 27 GHz airline, 40 GHz Coaxial Airline, 67 GHz Coaxial Airline and 110 GHz coaxial airline. We also use waveguide to characterize materials to 110 GHz.